For other uses, see Oud (disambiguation). The oud (Arabic: عود‎ ʿūd [ʕuːd]) is a short-neck lute-type, pear-shaped stringed instrument (a chordophone in the Hornbostel-Sachs classification of instruments) with 11 or 13 strings grouped in 5 or 6 courses, commonly used predominantly in Western Asia and North Africa: in Egypt, Syria, Sudan, Palestine, Lebanon, Iraq, Kurdistan, Yemen, Arabia, Iran, Greece, Armenia, Turkey, Azerbaijan, and other ethnic music like Jewish music, North African Chaabi, Classical, and Spanish Andalusian. The oud is very similar to modern lutes, and also to Western lutes. The modern oud is most likely derived from the Persian barbat. Similar instruments have been used in the Middle East, North Africa, and Central Asia for thousands of years, including from Mesopotamia, Egypt, North Africa, the Caucasus, and the Levant; there may even be prehistoric antecedents of the lute. The oud, as a fundamental difference with the western lute, has no frets and a smaller neck. It is the direct ancestor of the European lute. The oldest surviving oud is thought to be in Brussels, at the Museum of Musical Instruments. "[and the] length [of the ‛ūd] will be: thirty-six joint fingers – with good thick fingers – and the total will amount to three ashbār. [Notes 1] And its width: fifteen fingers. And its depth seven and a half fingers. And the measurement of the width of the bridge with the remainder behind: six fingers. Remains the length of the strings: thirty fingers and on these strings take place the division and the partition, because it is the sounding [or "the speaking"] length. This is why the width must be [of] fifteen fingers as it is the half of this length. Similarly for the depth, seven fingers and a half and this is the half of the width and the quarter of the length [of the strings]. And the neck must be one third of the length [of the speaking strings] and it is: ten fingers. Remains the vibrating body: twenty fingers. And that the back (soundbox) be well rounded and its "thinning"(kharţ) [must be done] towards the neck, as if it had been a round body drawn with a compass which was cut in two in order to extract two ‛ūds". In Pre-Islamic Arabia and Mesopotamia, the oud had only three strings, with a small musical box and a long neck without any tuning pegs. But during the Islamic era the musical box was enlarged, a fourth string was added, and the base for the tuning pegs (Bunjuk) or pegbox was added. In the first centuries of (pre-Islamic) Arabian civilisation, the oud had four courses (one string per course — double-strings came later), tuned in successive fourths. Curt Sachs said they were called (from lowest to highest pitch) bamm, maṭlaṭ, maṭnā and zīr. "As early as the ninth century" a fifth string ḥād ("sharp") was sometimes added "to make the range of two octaves complete". It was highest in pitch, placed lowest in its positioning in relation to other strings. Modern tuning preserves the ancient succession of fourths, with adjunctions (lowest or highest courses) which may be tuned differently following regional or personal preferences. Sachs gives one tuning for this arrangement of five pairs of strings, d, e, a, d', g'. Historical sources indicate that Ziryab (789–857) added a fifth string to his oud. He was well-known for founding a school of music in Andalusia, one of the places where the oud or lute entered Europe. Another mention of the fifth string was made by Al-Hasan Ibn al-Haytham in Ḥāwī al-Funūn wa Salwat al-Maḥzūn. The Arabic: العود‎ (al-ʿūd or oud) literally denotes a thin piece of wood similar to the shape of a straw. It may refer to the wooden plectrum traditionally used for playing the oud, to the thin strips of wood used for the back, or to the wooden soundboard that distinguishes it from similar instruments with skin-faced bodies. Henry George Farmer considers the similitude between al-ʿūd and al-ʿawda ("the return" – of bliss). Oud means "from wood" and "stick" in Arabic. Multiple theories have been proposed for the origin of the Arabic name. A music scholar by the name of Eckhard Neubauer suggested that oud may be an Arabic borrowing from the Persian word rōd or rūd, which meant string. Another researcher, archaeomusicologist Richard J. Dumbrill, suggests that rud came from the Sanskrit rudrī (रुद्री, meaning "string instrument") and transferred to Arabic (a Semitic language) through a Semitic language. However, another theory according to Semitic language scholars, is that the Arabic ʿoud is derived from Syriac ʿoud-a, meaning "wooden stick" and "burning wood"—cognate to Biblical Hebrew ’ūḏ, referring to a stick used to stir logs in a fire. Names for the instrument in different languages include Arabic: عود‎ ʿūd or ʿoud (Arabic pronunciation: [ʕu(ː)d, ʢuːd], plural: أعواد aʿwād), Armenian: ուդ, Syriac: ܥܘܕ ūd, Greek: ούτι oúti, Hebrew: עוּד‎ ud, Persian: بربط‎ barbat (although the barbat is a different lute instrument), Turkish: ud or ut, Azeri: ud, and Somali: cuud or kaban. The complete history of the development of the lute family is not fully compiled at this date, but archaeomusicologists have worked to piece together a lute family history. The highly influential organologist Curt Sachs distinguished between the "long-necked lute" and the short-necked variety. Douglas Alton Smith argues the long-necked variety should not be called lute at all because it existed for at least a millennium before the appearance of the short-necked instrument that eventually evolved into what is now known the lute. The line of short-necked lutes was further developed to the east of Mesopotamia, in Bactria and Gandhara, into a short, almond-shaped lute. Curt Sachs talked about the depictions of Ganharan lutes in art, where they are presented in a mix of "Northwest Indian art" under "a strong Greek influences." The short-necked lutes in these Gandhara artworks were "the venerable ancestor of the Islamic, the Sino-Japanese and the European lute families." He described the Ganhara lutes as having a "pear-shaped body tapering towards the short neck, a frontal stringholder, lateral pegs, and either four or five strings." The oldest images of short-necked lutes from the area that Sachs knew of were "Persian figurines of the 8th century B.C.," found in excavations at Suza, but he knew of nothing connecting these to the Oud-related Ganharan art 8 centuries later. Bactria and Gandhara became part of the Sasanian Empire (224–651). Under the Sasanians, a short almond shaped lute from Bactria came to be called the barbat or barbud, which was developed into the later Islamic world's oud or ud. When the Moors conquered Andalusia in 711, they brought their ud along, into a country that had already known a lute tradition under the Romans, the pandura. 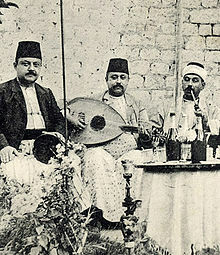 Syrian musicians in Aleppo with an oud, circa 1915. According to Abū Ṭālib al-Mufaḍḍal (a-n-Naḥawī al-Lughawī) ibn Salma (9th century), who himself refers to Hishām ibn al-Kullā, the oud was invented by Lamech, the descendant of Adam and Cain. Another hypothetical attribution says that its inventor was Mani. Ibn a-ṭ-Ṭaḥḥān adds two possible mythical origins: the first involves the Devil, who would have lured the "People of David" into exchanging (at least part of) their instruments with the oud. He writes himself that this version is not credible. The second version attributes, as in many other cultures influenced by Greek philosophy, the invention of the oud to "Philosophers". One theory is that the oud originated from the Persian instrument called a barbat (Persian: بربط ) or barbud, a lute indicated by Marcel-Dubois to be of Central Asian origin. The earliest pictorial image of the barbat dates back to the 1st century BC from ancient northern Bactria and is the oldest evidence of the existence of the barbat. Evidence of a form of the barbaṭ is found in a Gandhara sculpture from the 2nd-4th centuries AD which may well have been introduced by the Kushan aristocracy, whose influence is attested in Gandharan art. The name barbat itself meant short-necked lute in Pahlavi, the language of the Sasanian Empire, through which the instrument came west from Central Asia to the Middle East, adopted by the Persians. The barbat (possibly known as mizhar, kirān, or muwatter, all skin topped versions) was used by some Arabs in the sixth century. At the end of the 6th century, a wood topped version of the Persian-styled instrument was constructed by al Nadr, called "ūd", and introduced from Iraq to Mecca. This Persian-style instrument was being played there in the seventh century. Sometime in the seventh century it was modified or "perfected" by Mansour Zalzal, and the two instruments (barbat and "ūd shabbūt") were used side by side into the 10th century, and possibly longer. The two instruments have been confused by modern scholars looking for examples, and some of the ouds identified may possibly be barbats. Examples of this cited in the Encyclopedia of Islam include a lute in the Cantigas de Santa Maria and the frontispiece from The Life and Times of Ali Ibn ISA by Harold Bowen. The oldest pictorial record of a short-necked lute-type vīnā around the 1st to 3rd centuries AD. The site of origin of the oud seems to be Central Asia. The ancestor of the oud, the barbat was in use in pre-Islamic Persia. Since the Safavid period, and perhaps because of the name shift from barbat to oud, the instrument gradually lost favor with musicians. Turkish-style oud, as played in Turkey, Greece, Armenia, etc. Modern-day ouds fall into three categories: Arabian, Turkish, and Persian, the latter also being known locally as a barbat. This distinction is not based solely on geography; the Arabic oud is found not only in the Arabian peninsula but throughout the Arab-world. Turkish ouds have been played in Greece, where they are called outi, and in other locations in the Mediterranean. The Arabian ouds, such as the Iraqi oud, Egyptian oud and Syrian oud, are normally grouped under the term 'Arabian oud' because of their similarities, although local differences may occur, notably with the Iraqi oud. However, all these categories are very recent, and do not do justice to the variety of ouds made in the 19th century, and also today. Arabian ouds are normally larger than their Turkish and Persian counterparts, producing a fuller, deeper sound, whereas the sound of the Turkish oud is more taut and shrill, not least because the Turkish oud is usually (and partly) tuned one whole step higher than the Arabian. Turkish ouds tend to be more lightly constructed than Arabian with an unfinished sound board, lower string action and with string courses placed closer together. Turkish ouds also tend to be higher pitched and have a "brighter timbre." Arabian ouds have a scale length of between 61 cm and 62 cm in comparison to the 58.5 cm scale length for Turkish. There exists also a variety of electro-acoustic and electric ouds. The modern Persian Barbat resembles the oud, although differences include a smaller body, longer neck, a slightly raised fingerboard, and a sound that is distinct from that of the oud. See more information at the page: Barbat (lute). The Cümbüş is a Turkish instrument that started as a hybrid of the oud and the banjo. Different ways of tuning the oud exist within the different oud traditions. Among those playing the oud in the Arabic tradition, a common pattern of tuning the stings is (low pitch to high): D2 G2 A2 D3 G3 C4 on single string courses or D2, G2 G2, A2 A2, D3 D3, G3 G3, C4 C4 for a course of two strings. In the Turkish tradition, the "Bolahenk" tuning, is common, (low pitch to high): C2 F2 B2 E3 A3 D4 on instruments with single string courses or C2, G2 G2, B2 B2, E3 E3, A3 A3, D4 D4 on instruments with courses of two strings. The C2 and F2 are actually tuned 1/4 of a tone higher than a normal c or f in the Bolahenk system. The Zenne oud, often translated as a women's oud or female oud is a smaller version of the oud designed for those with smaller hands and fingers. It usually has a scale length of 54–56 cm, instead of the 60–62 cm of the Arabic oud, and the 57–59 cm of the Turkish oud. The oud arbi is a North African variant of the oud with a longer neck and only 4 courses. It is not to be confused with the differently shaped and tuned Kwitra. ^ The shibr (singular of ashbār) is a measurement unit which equals roughly 18-24 cm, depending on the hand. It equates to the measured length between the tip of the thumb and the tip of the auricular finger when stretched flat and in opposite directions. The shibr otherwise measures 12 fingers (36:3): a 'full' finger should be about 2 cm in width. ^ "The Arab World". 1971. ^ "oud - Definition of oud in English by Oxford Dictionaries". Oxford Dictionaries - English. Retrieved 3 October 2018. ^ Mottola, R.M. (Summer–Fall 2008). "Constructing the Middle Eastern Oud with ter Kyvelos". American Lutherie (94, 95). ^ 1947-, Dumbrill, Richard J. (Richard Jean), (2005). The archaeomusicology of the Ancient Near East. Victoria, B.C. : Trafford. p. 308. ISBN 9781412055383. OCLC 62430171. ^ "Alexandria to Brussels, 1839". oudmigrations. Retrieved 2016-04-15. ^ a b Beyhom, Amine (2010). Théories de l'échelle et pratiques mélodiques chez les Arabes – Volume 1 : L'échelle générale et les genres – Tome 1 : Théories gréco-arabes de Kindī (IXe siècle) à Ṭūsī (XIIIe siècle). Paris: Geuthner. ISBN 978-2-7053-3840-4. ^ Beyhom, Amine (2011). Paper for "The Oud from its Sumerian Origins to Modern Times", ICONEA Conference 2011 – 1–3 December 2011. "Two persistent misapprehensions about the ʿūd" (PDF). Iconea 2011: 81–110 (85). ^ a b c During, Jean (1988-12-15). "Encyclopaedia Iranica - Barbat". Iranicaonline.org. Retrieved 2012-02-04. ^ Kurtz, Glenn (2008-11-19). Practicing: A Musician's Return to Music. ISBN 9780307489760. ^ Humphrey, Andrew (2009). Egypt. ISBN 9781426205217. ^ "Search Entry". www.assyrianlanguages.org. Retrieved 3 October 2018. ^ Sachs, Curt (1940). The History of Musical Instruments. New York: W. W. Norton & Company. pp. 251, 253. ^ Smith, Douglas Alton (2002). A History of the Lute from Antiquity to the Renaissance. Lute Society of America (LSA). ISBN 978-0-9714071-0-7. ^ a b c d Sachs, Curt (1940). The History of Musical Instruments. New York: W. W. Norton & Company. pp. 159–161. ^ a b During, J. "BARBAT". Encyclopaedia Iranica. ^ a b c d e f First Encyclopaedia of Islam: 1913-1936. Leiden: BRILL. 1993. p. 986. ISBN 978-90-04-09796-4. ^ Picken, Laurence (1955). "The origin of the short lute". The Galpin Society Journal. 8: 32–42 (40). doi:10.2307/842155. JSTOR 842155. With the evidence as yet available, it is reasonable to place the site of origin of the short lute in Central Asia, perhaps among Iranised Turco-Mongols, within the area of the ancient first-century kingdom of the Kusanas. This conclusion must not be taken to exclude the possibility that short lutes first appeared somewhat earlier and somewhat further to the West-in Parthia, for example; but at present the evidence of the Kusana reliefs is the only evidence of their existence in the first century[...] The lutes of the Kusanas would seem to be the first representations of undoubted short ovoid lutes; and Fu Hsüan’s essay, one of the first texts in any language devoted to a short lute, though not to an ovoid lute. ^ Lawergren, Bo (2001). "Iran". The New Grove: 521–546 (534). ^ a b Goldrick, Navid (16 August 2013). "Persian Oud – Barbat". majnunn music and dance. Retrieved 31 March 2018. Because of these efforts the Arabic Oud and the Barbat are now once again part of the Iranian musical landscape. ^ "Oud". sonsdelorient.com. Retrieved 9 August 2018. ^ "Types of ouds". arabinstruments.com. Retrieved 9 August 2018. ^ "Types of Ouds : The Ultimate Oud Buyers' Guide Part 1 - Oud for Guitarists". Oud for Guitarists. 2013-09-17. Retrieved 2017-01-27. ^ "The journeys of Ottoman ouds". oudmigrations. 2016-03-08. Retrieved 2016-04-26. ^ "OUD CAFE - Stringing & Tuning". www.oudcafe.com. Retrieved 2017-01-27. ^ "About the Turkish oud". arabinstruments.com. Retrieved 9 August 2018. ^ "Types of Ouds : The Ultimate Oud Buyers' Guide Part 1 - Oud for Guitarists". 17 September 2013. Retrieved 3 October 2018. ^ a b c d "Stringed Instrument Database N-O". stringedinstrumentdatabase.aornis.com. Retrieved 8 August 2018. ^ a b c Parfitt, David. "Tuning the oud". oudipedia.info. Retrieved 8 August 2018. ^ "The Stringed Instrument Database: N-O". stringedinstrumentdatabase.aornis.com. Retrieved 3 October 2018. ^ "Andalusische Oud". 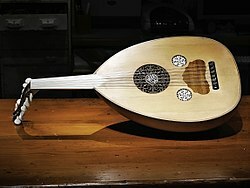 khoudir-oud.com. Retrieved 3 October 2018. ^ "But is it an oud? - oudmigrations". 7 March 2016. Retrieved 3 October 2018. ^ "The oud of Tunisia - oudmigrations". 14 August 2017. Retrieved 3 October 2018. Rebuffa, David. Il Liuto, L'Epos, (Palermo, 2012), pp. 22–34. Wikimedia Commons has media related to Ouds.